ItalJet founder Leopoldo Tartarini was a pilot, and later a factory racer for Ducati. When an injury prevented him from competing in the top ranks, he still had a year on his contract with Ducati; a huge publicity tour was undertaken – the Ducati World Adventure in 1954. This 37,282 mile trip was far more harrowing and adventurous than he had imagined, involving illness, bar fights, robbery, imprisonment under a mistaken identity, and climactic challenges. Upon completion, Tartarini established ItalJet. 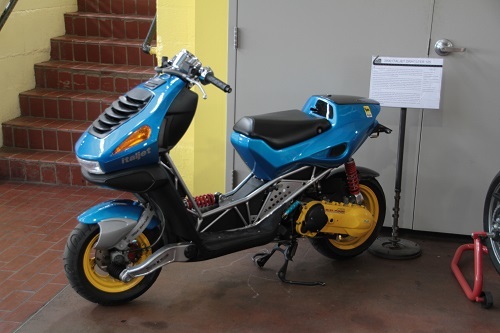 Italjet has been making scooters, motorcycles, and now electric bicycles since 1959, with over 150 designs to their credit. Their earmarks include “creativity and innovation, design and technology, eclecticism and discipline, and sophisticated models throughout motorcycle history.” The ItalJet philosophy is “to create stylish products with a strong personality; to innovate and anticipate the public’s taste and fashion, while staying one step ahead of the competition.” In 1980, MoMA (the Museum of Modern Art in NYC) added an ItalJet PACK 2 to their permanent collection – their only motorized two-wheeler, while the Guggenheim included a Formula 50 LC in The Art of the Motorcycle exhibit. The Formula 50 LC has won Scooter of the Year awards 4 times in 3 countries. 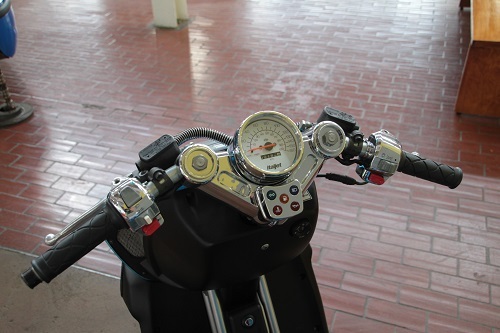 The Dragster seen here is a mid-range 125cc model; a 50cc and 180cc were also offered, but differed only in power. All models offered flamboyant styling, a stiff, visible Ducati-like tubular structure, automatic “Twist and Go” transmission, ample storage, BiMota-style hub-center steering with a beefy front swingarm, disc brakes, wide tires, and a water-cooled, electric-start single. 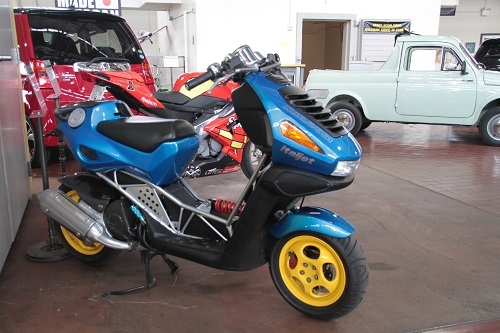 Out of production for over a decade, the scooter has a large cult following and substantial aftermarket support. Malossi, in particular, offered many upgrade parts for the 125.